When handled correctly, activity and behavior charts can be very successful in creating a positive pattern of behavior. Listed are ideas to help you correctly implement a chart as well as links to free printable charts. We have tried our share of chore charts and posters. These Magnetic Chore Boards have been by far the best. Click here for directions and tips. Especially an issue among children with Sensory Processing Disorder, some children do not understand how loud their voices are. Use this chart to help them control their volume. Free download. Tips: Bubs has gotten in trouble for volume control almost his whole life. Not long after he was diagnosed with Sensory Processing Disorder, I realized that he truly could not decipher the five different levels of volume. Bubs and I ventured outside to practice each of the five numbers. Then we hung the sheet on the refrigerator as a reference. Whenever his volume got too high, we walked to the chart. I would say, "You are using your ___ voice. When are you supposed to use this voice? I want you to use the number ____ voice. Please show me how this voice sounds." Then we progressed to "What voice are you using? What voice should you be using?". 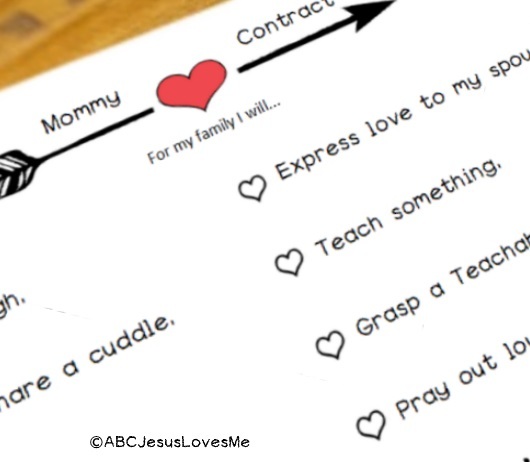 After much request on the ABCJLM Facebook Group, I created this Mommy Contract to help you be intentional with your family. 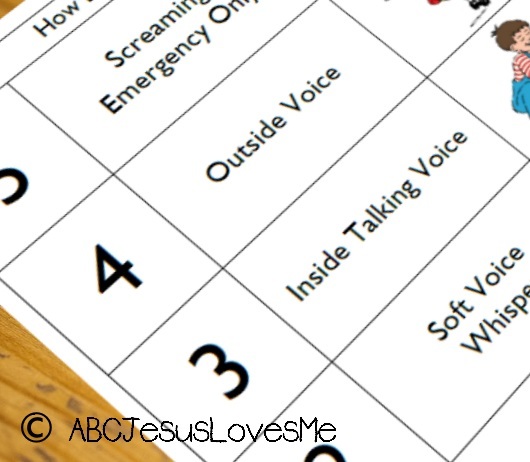 Post for family accountability or keep in your Quiet Time Journal for daily reflection. Free download. Be consistent. If leeway is given one time and not another, a mixed message is sent to the child and the chart loses its excitement. Make sure that the child understands exactly what the expectations are. Create a chart that doesn't includes vague, broad language (ie. be good, obey, behave) as there is no way to judge general ideas. The more specific the behavior is, the easier it will be for you and the child. If the child can not read, use pictures instead of words. To begin, set expectations low enough for the child to be successful. Then, slowly raise the expectations. Standards that are too high will lead to frustration on everyone's part. At the same time, do not fill the chart with frivolous expectations. Rewards may be based upon a day or an accumulative amount of time, but should be simple and inexpensive. Only give a reward if the child has completely finished the goal. Do not cave! Introduce the chart to your child in a positive way and begin immediately. Work together to choose a reward. Never underestimate the power of a hug, high five, and penny. Rarely should rewards be expensive. Give the chart time. Depending on the child's personality and age, it may take several weeks to change a bad habit. Behavior will not change over night. And, the behavior may get worse before it gets better. This occurs because the child is checking to see if the boundaries are indeed firm and that you won't cave.